Since the Islamic conquer of Egypt in 642 A.D, its has always been a centre of Islamic culture and learning throughout history. 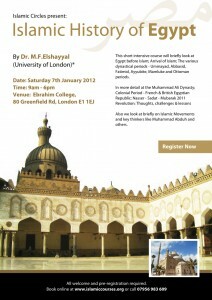 An ancient civilisation where Prophets lived, preached and fought against oppression and tyrany and a people who took up the religion producing some of the greatest scholars and institutions and warriors who defeated both the Crusaders and Mongols and even today, "Islam & Muslims" in Egypt make an important contribution to the wider Muslim world and beyond. The various dynastical periods – Ummayad, Abbasid, Fatimid, Ayyubite, Mamluke and Ottoman periods. Thoughts, challenges & lessons that may be learned. Also we look at briefly on Islamic Movements and key thinkers like Muhammad Abduh and others. Son of Egypt’s leading Historian on Salahudinm the late Gamal el-Din Elshayyal whose students included Prof. Bernard Lewis. Dr Fareed obtained his PhD from the University of Edinburgh in 1986 and has taught at Universities of Toronto, Imam Muhammad Ibn Saud, Edinburgh, Salford, Birmingham, Westminster and Alexandria. Dr Elshayyal has been a member of the advisory board of SOAS Centre for Islamic Studies, consultant to Al-Furqan, Foundation for Islamic Heritage, London, and HBO in the USA, member of UMO Education Council in UK and Ireland and The European College for Human Sciences. He has been Examiner for Ministry of Defence School of Languages, Arabic Diploma, Foreign and Commonwealth Office and external examiner and assessor to more universities in UK and Saudi Arabia. Recently he was Senior Lecturer in Islamic History and Islamic Sources and Head of Islamic Studies at the Markfield Institute of Higher Education. Some of Dr El Shayyal’s work includes: Tarikh al-Duwal wal-Muluk, from Ibn Al-Furat, Volume 2, Edited with an introduction and extensive study of the work and the author. Dar Al-Wafa’, Cairo, 1997. ‘"Abbas Al-‘Aqqad, & his Journey from Scepticism to Faith", Islamic Quarterly, 46:4, Dec. 02. "Ibn al-Furat, an Egyptian Historian from the 15th century", Islamic Quarterly, 47:2, June 2003. "Relations between Nur al-Din and Salah al-Din as portrayed in Ibn al Athir’s al Kamil fi al Tarikh, IQ, 48: 3, Sep. 2004. Currently Dr Elshayyal teaches Arabic and Islamic Studies at both Kings College and SOAS, London..